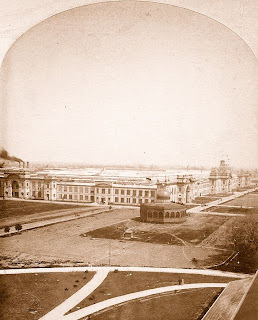 Located approximately at the center of the site, the Main Building was the largest exhibition structure erected for the World's Industrial and Cotton Centennial Exposition. Designed by Mississippi architect Gustav M. Torgerson, the structure contained thirty-three acres of unobstructed exhibit space, and measured 1,378 feet wide by 905 feet deep. Constructed entirely of wood, the building was designed in an eclectic Italian renaissance style with pre-fabricated detailing on the exterior walls. Eleven entrances gave access to the interior.....five of these entrances being situated along the east side, and three each on the north and south sides. The building's prominent main entrance was located beneath a 115-foot high mansard-roofed tower, and flanked by two smaller towers of similar design. 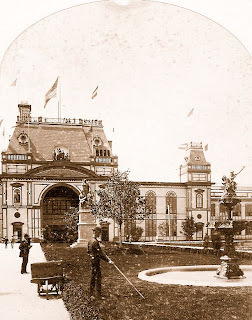 Two electric elevators provided access to the tower's roof, where a panoramic view of the exposition grounds could be obtained. Four large secondary entrances were similar in design to the main entrance, but lacked the mansard roofs. Additionally, six smaller portals were located adjacent to the other five prominent entrances. Numerous windows were placed along the building's four sides, and the majority of the expansive roof was composed of large glass skylights, providing natural lighting to the vast open interior. Contained within the building was commodious display space for hundreds of exhibits. 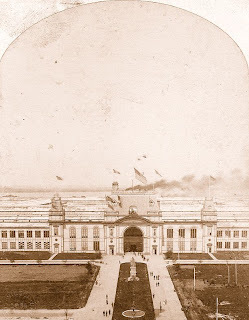 Along the building's entire eastern side, and sections of the north and south sides, were located exhibits from United States manufacturers, occupying an area of approximately eight acres. 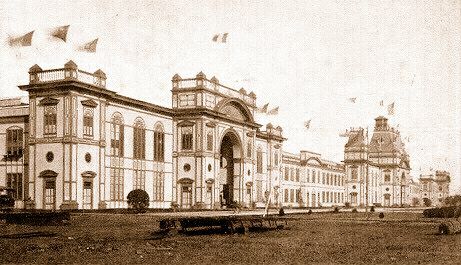 In the western portion of the building was located Machinery Hall, covering approximately ten acres. 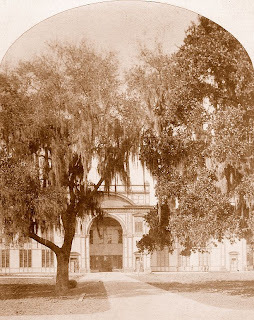 At the center of the Main Building was located the 11,000 seat Music Hall, surrounded by spacious galleries. 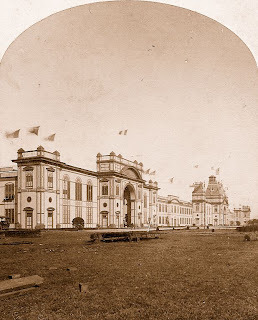 On either side of Music Hall, stretching north & south, were the exhibits from the various foreign nations which participated in the exposition. Lastly, a large section at the north end of the building contained displays of agricultural implements. 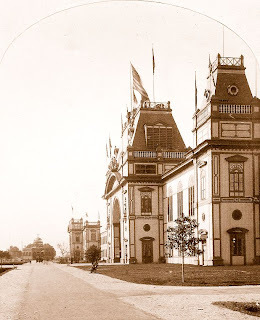 Offices for the exposition's directors, and other management, were located within the several pavilions formed by the building's entrances. Spacious second-floor galleries completely surrounded the interior of the structure, and were accessible by numerous stairways and several electric elevators. These galleries offered visitors a bird's-eye view over the acres of exhibits contained within the building. At night the interior was completely illuminated by 800 electric arc-lights, and Edison incandescent electric lights in the Music Hall and offices of the exposition's management.